As an inbound marketing agency, analytics are the powerful data that tell the story of your service offering's performance. With so many moving parts, and so many tools in your marketing stack we understand how important it is for you to showcase your results in a way that your clients will truly understand. Whether you offer SEO, PPC, content, email, or social we have you covered. Why do so many agencies choose Klipfolio? Deliver fully customized reports to your clients - down to the logo and css of the platform. With Klipfolio’s editor, you never have to settle. Get the exact visualizations you’ve been dreaming of. No matter where you are, never lose sight of your inbound marketing data with Klipfolio’s mobile apps. Our 24 hour support team is one of the best rated in the world. Chat with us live or send us a ticket. Connect to virtually anything using one of our 100s of data connectors or using an API call. Need an easy workaround? 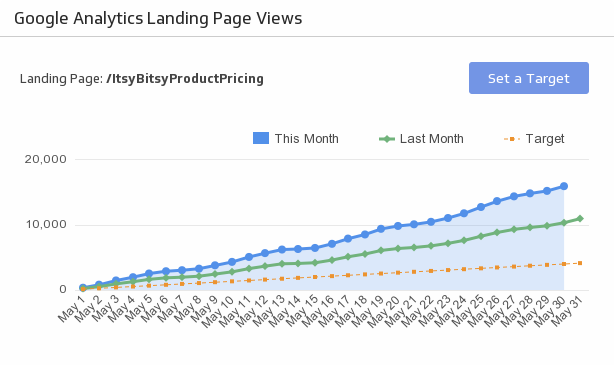 We have tons of pre-built content that can be immediately deployed for instant insights. SEO is a core function used to measure website performance for organic search results. By analyzing key metrics such as SEO keyword ranking, click-through rate, and SEO traffic, you can determine top performing pages, top converting keywords, and areas of your website that need to be optimized. Managing your social media marketing efforts means staying on top of analytics. From a monitoring perspective, having a social media dashboard brings key data points like social traffic and conversions, social followers, and Facebook ads campaign performance together all in one place. As an inbound marketing agency, you know first hand the impact that good content can have on business. To do content well, measuring your progress constantly is crucial. By setting up a content effectiveness dashboard, you can see metrics like blog subscribers, blog views, and keywords driving traffic in real time. So it’s easy to stay on top of your game. You understand the importance of driving conversions while getting the lowest Customer Acquisition Cost (CAC) with the highest Return on Investment (ROI) means your campaigns are working. But how do you prove it? It’s as easy as pulling data from your paid channels, Google Analytics, or Google Sheets to create custom dashboards to share with your organization and clients. Your customers are buying online, so ensuring you’re showing up in their searches is the key of any good content strategy. 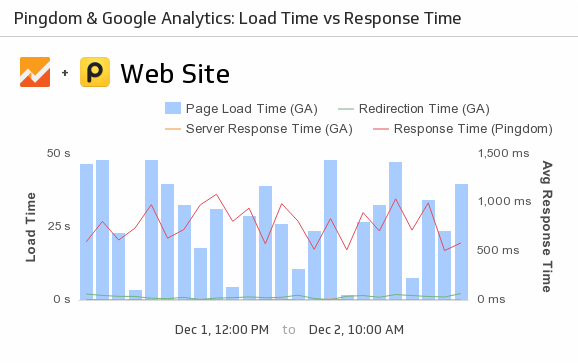 With dashboards, your inbound marketing analytics are all in one place. Monitor how well your sales team is moving your inbound marketing leads through the sales pipeline. Which initiatives are bringing in the best leads and are they converting? Dashboards help you sync sales and marketing so you win everytime. Lead nurturing can come in many forms depending on your company’s objectives. Whether you are focusing on driving engagement through content or active funnel engagement, staying on top of your sales data helps you remain focused. By building a sales dashboard, you can easily generate insights to set targets and project future sales performance. As an Inbound Marketing Agency, your day-to-day is rarely the same due to a variety of tasks with competing deadlines. Project management dashboards are a great for you to measure and monitor individual campaigns and ensure your team remains on track. "Being able to reduce the time spent on manual reporting and focusing on the decision making really is the key to success. Luckily we have Klipfolio helping with that." "They give us real-time insights into which posts and ads are working best -- down to the penny." "Setup is easy with Klipfolio. It has a large number of pre-built data sources that help our clients set up dashboards quickly." 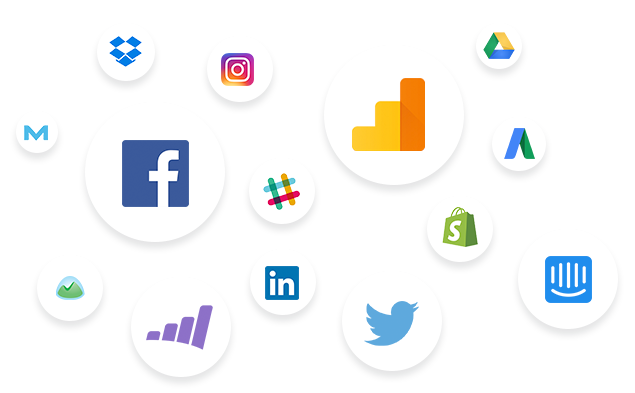 Klipfolio allows you to pull in data from all of the different marketing services you use to track your performance—and display precisely what you need in a single interactive dashboard. What does this mean for you? No more piecemeal reports or spreadsheets with multiple versions. Take control of the way you analyze your data. As a marketing agency, you don’t want to get locked down by a the branding of your reporting software provider, you want to make your analytics dashboard unique to your case and for your clients to have a streamlined experience. Klipfolio White Labelling gives you the capability to deliver fully customized inbound marketing reports to your clients. Whether you want to maintain brand consistency throughout your offering’s experience, or you want to deliver dynamic dashboards that match your clients’ branding, you can customize everything on the Klipfolio platform. With Klipfolio flexible Klip Editor, you can create virtually any metric iteration you’ve dreamed of from the ground up. Using formulas, filters, indicators, and annotations, you can manipulate your data and display exactly what you want on your or your clients dashboard. You can also combine multiple data sources into a single visualization - even if they’re in different formats. For example, you can mash up a Google Analytics data source with a Salesforce data source, to create a custom KPI that relates web traffic to leads, trials or sales. The prospect of endless visualization possibilities can be daunting. To help you out, we’ve curated an extensive list of digital marketing, SEO, social media, and email marketing KPIs and metrics that agencies and data-driven teams alike use to monitor their inbound performance. Your clients are mobile, their reports should be too! No matter where you are, no matter that time of day it is, Klipfolio dashboards can always be with you using our mobile apps for Apple and Android. 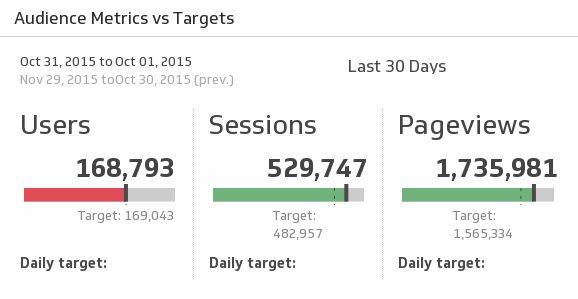 We also have tons of ways to share your marketing reports. Whether your organization needs 1 seat or 1,000 (or 10,000+), we can handle it. Our user and group management model is inherently scalable and simply managed. Learn more about pricing. You can set-up regular email reports based on individual data visualizations or entire dashboards. Schedule emails to go out to specific people, at specific times, and with what frequency. This one is a pretty popular sharing method with our Agency partners. Individuals data visualizations and entire dashboards can be downloaded as an image or as a PDF (great for presentations and printed reports), and easily attached to an email. You can set your dashboards to ‘full screen TV mode’ within Klipfolio, and display them on office wall boards and monitors via Airtame, Chromecast or Rise Vision. Multiple dashboards can be set up to display on rotation. Using wallboards to highlight your metrics is a great way to keep your team’s data-driven and ensure that you never lose sight on your performance. You can embed individual data visualizations or entire dashboards with your website or host application, and the embed will look seamless. Use our simple drop down menus to adjust the size and look of the data visualization you want to embed, then generate the embed code with a click of a button, and drop it into your web page’s HTML. Klipfolio enables users to annotate individual Klips and dashboards, to collaborate and share insights. Once our Slack integration is enabled in your account settings, sharing individual Klips or dashboards with users or channels in Slack is quick and easy. Whether you need help connecting with your data, building a metric, managing a client’s account, we’re here for you. Our world-class support team is available at any time through our chat screen or support ticket. But our support resources don’t stop there, we have a community forum and hundreds of articles on our Support Page that cover pretty much everything you could need to know about working in Klipfolio. Contribute, ask questions, get answers, and learn from other Klipfolio users in our Community Forum. Our Knowledge Base is filled with informative articles to help you learn everything you need to know. Why do so many agencies use Klipfolio? There are quite a few reasons, but our 100+ integrations is a big one. Your clients data may be scattered in different places, but with a dashboard all that data can be in one view. Use out-of-the-box, hassle-free connectors for hundreds of data sources, including spreadsheets, files, databases, and web services applications. Sometimes there isn’t enough time to build. Other times, it’s a matter of convenience. Either way, we have your back. Klipfolio’s Gallery houses hundreds of pre-built dashboards and Klips that are ready for you to add directly to your dashboard so you can get monitoring in minutes! 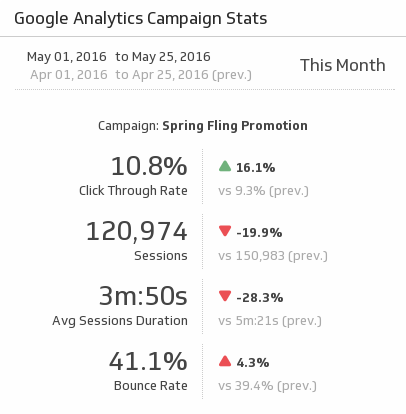 Reach your current and month-to-month advertising goals with detailed metrics on each of your AdWords campaigns.